Freedom of Information (FOI) Hall of Shame. 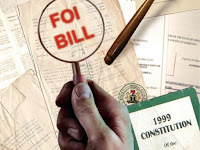 It cited the violation of various provisions of the FOI Act, 2011 by the Bureau, including its failure to submit any annual report of its implementation of the Act to the Attorney-General of the Federation over the last six years. John Gbadamosi, MRA’s Programme Officer, said in a statement that although the Bureau proactively published on its website a description of the organization and its responsibilities, including details of the programmes and functions of each of its departments, it failed to publish 15 other classes of information that it is required to proactive disclose by section 2(3) (b-f) of the FOI Act. “There is also no indication whatsoever that the Bureau has provided the appropriate training for its officials on the public’s right of access to information or records held by the Bureau or trained them to effectively implement the Act, as it is required to do by section 13 of the FOI Act”. Last week, the group published a list of individuals and government agencies, including high court judges, who repeatedly failed to comply with the provisions of the FOI law. The latest attempt to publicly shame those who violate the law came barely one month after the Attorney General of the Federation published a report blaming Nigerians for making “little use” of the FOI Act six years after it became law. The FOI Act, signed into law by former President Goodluck Jonathan, mandates public institutions to respond to requests for public records, except those relating to national security, within seven days, failure of which attracts a fine of N500,000 payable upon conviction. Last year, a civil society group, Right to Know, published a report stating that only 44 public institutions submitted FOI annual reports to the Office of the AGF in 2016 (down from 60 in 2015), a tiny fraction of the over 800 public institutions in the country. While inducting the BPE into the FOI Hall of Shame on Monday, Mr. Gbadamosi said the Bureau has consistently failed to proactively disclose information relating to its receipt or expenditure of public or other funds, as required by section 2 (3) (d) (v) of the Public Enterprises (Privatisation and Commercialisation) Act of 1999. Established by Section 12 of the Act, the BPE is charged with the overall responsibility of implementing the policy on privatization and commercialization. The BPE says its mission is to be the key driver of the Government’s economic reform programme; to be the resource centre for capacity building and sustenance of reforms through: promoting a competitive economy and enfranchising Nigerians; enthronement of effective corporate governance and financial discipline in the public and private sectors; as well as institutionalising social accountability and efficient deployment of public resources. Mr. Gbadamosi noted that BPE also failed to disclose other categories of records under its control in sufficient detail to facilitate the exercise of the right to information under the Act as well as the manuals used by its employees in administering or carrying out any of its programmes or activities in accordance with section 2(3) (b) of the FOI Act. MRA also cited the failure of the Bureau to publish on its website or any other public platform the title and address of the appropriate officer to whom applications for information under the FOI Act should be made, as required by Section 2(3) (f) of the Act. “One of the functions of the Bureau, as stated by section 13(i) of the Public Enterprises (Privatisation and Commercialisation) Act, is to ensure the success of the privatisation exercise taking into account the need for balance and meaningful participation by Nigerians and foreigners in accordance with relevant laws of Nigeria,” Mr. Gbadamosi said. He also noted that there is little or no information available on its handling of FOI requests, making it is difficult to determine the extent of the Bureau’s responsiveness to requests for information made to it by members of the public under the FOI Act. Launched by MRA on July 3, 2017, the “FOI Hall of Shame” highlights public officials and institutions that are undermining the effectiveness of the FOI Act through their actions, inactions, utterances, and decisions.